Fun Day on the Water! Today, Saturday, started out with rain early this morning. Temperatures were in the mid 40s. Felt pretty good going out the door. Rain stopped, sun came out, went back in and is now back out again. However, you can feel the temperatures falling and the wind picking up. Supposed to be pretty cool, or down right cold, for the next couple days. Think by Thursday or Friday, things should start warming up again. Water has been in the off early, on for a few hours then back off for 5-6 hours and back on mode all week, including yesterday. Today, it is off! Don’t get too excited, the projection for tomorrow and Monday is back on again all day both days. Jim out all day yesterday with John from Kansas. John fished with Jim last year and decided to give it a try again. Despite crazy water yesterday, 710 feet in the a.m. and dropping all day, but never off, they had a pretty good day on the red midge, ruby midge, gray scud and olive wooly bugger. Our Louisiana guys, Albert and James Albert, kept Darrell busy. They had a good day on the pink and dark roe egg patterns and the red big and small ruby midges. Near the end of the trip, James Albert hooked into this nice rainbow. Meanwhile, Carolyn and Dawn, were out playing for the day. We had a fun and fish filled, crazy fishing day on the UV gray scud, big ruby midge, the dark roe egg pattern, and a size 18 black zebra midge. Although Dawn , aka “the stripper” would rather strip patterns, they just weren’t hitting these hot and heavy. We did catch some on holographic green cracklebacks and a rockworm green soft hackle. It was a good day on the water! Beautiful weather…we enjoyed it to the hilt. 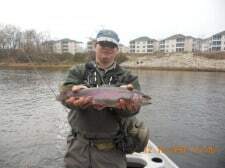 This entry was posted on Saturday, December 11th, 2010 at 2:49 pm	and is filed under Fishing Reports. You can follow any responses to this entry through the RSS 2.0 feed. You can leave a response, or trackback from your own site.